Provost and Dean of Faculties David Quigley and Vice President for Student Affairs Barb Jones released a statement Monday condemning racist events on campus that occurred over the weekend. On Friday, two signs reading “Black Lives Matter” in Roncalli Hall were defaced to read “Black Lives Don’t Matter.” In addition, a screenshot of a Snapchat showing a blackened steak and cheese with the caption “I like my steak and cheese like I like my slaves” has been circulating widely on Facebook since Sunday night. 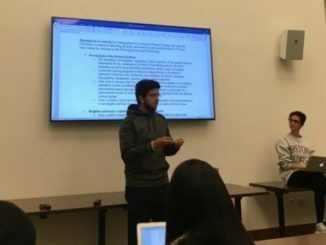 “Several incidents of racist behavior, including vandalism in a residence hall and a disturbing social media post, occurred this weekend on the BC campus. “Boston College condemns all acts of hate and is committed to holding any student who violates our standards accountable. “Federal privacy laws preclude our discussion of individual disciplinary matters, other than to say that a thorough investigation is ongoing. “Staff from the Bowman AHANA Intercultural Center, Dean of Students, and University Counseling Services are available to students for support and conversation. “In reference to the unfortunate events that transpired over the weekend the Montserrat staff would like to say we stand in solidarity with any and all individuals who were impacted (including our staff). We will not give in to the ignorance that is racism or any other “ism” on this campus. Again we are an office that is made up of students from all backgrounds, color, religions, races, gender identities, political views, and every other identifying factor that seems to have been created to divide us. There is a reason we consider ourselves family as we are accepting of ALL! Our differences are what make us beautiful. We will not tolerate insensitivity, bigotry, or any other form of negativity on OUR campus or in this office. “Lastly we want you to know that our office is open to anyone who feels the need to talk, cry, be pissed, need a safe place, needs a hug, or just needs support. This house is YOUR home, this campus is YOUR campus, and EVERYONE deserves to be respected and feel safe on here.